You may have noticed that I like to cook; when it comes to most foods, I'm always looking for new versions of my favourites. Why make plain macaroni & cheese when you can make sriracha mac & cheese? Why make a pepperoni pizza when you can make a goat cheese, leek and mushroom pizza? Why make ramen from a package when you could make kimchi egg yolk ramen? I can hardly remember the last time I made the same recipe twice; while I make loads of recipes I adore, I'm always looking for the next delicious thing or the coolest riff on something I already love. Which is why it really means something when I say that my other grandmother (not Eleanor) makes the best cinnamon rolls. Her cinnamon rolls are so good that when December rolls around and every food magazine is coming up with new twists on the classic (orange-scented with cranberries! Chocolate with caramel sauce! Mincemeat with Marzipan frosting! ), I flip straight past. Ever since I learned to cook, I've never made another cinnamon roll recipe; what would be the point? It took the Recipe Box Project to get me to try a (slightly) new version of cinnamon rolls and no one is more surprised than me that I actually liked them! It shouldn't have been a surprise; the recipe required pre-made crescent rolls and since those aren't available here, I made my own dough according to the legendary recipe I'm attached to. But instead of her filling and glaze, I followed the Recipe Box version and it's amazing. 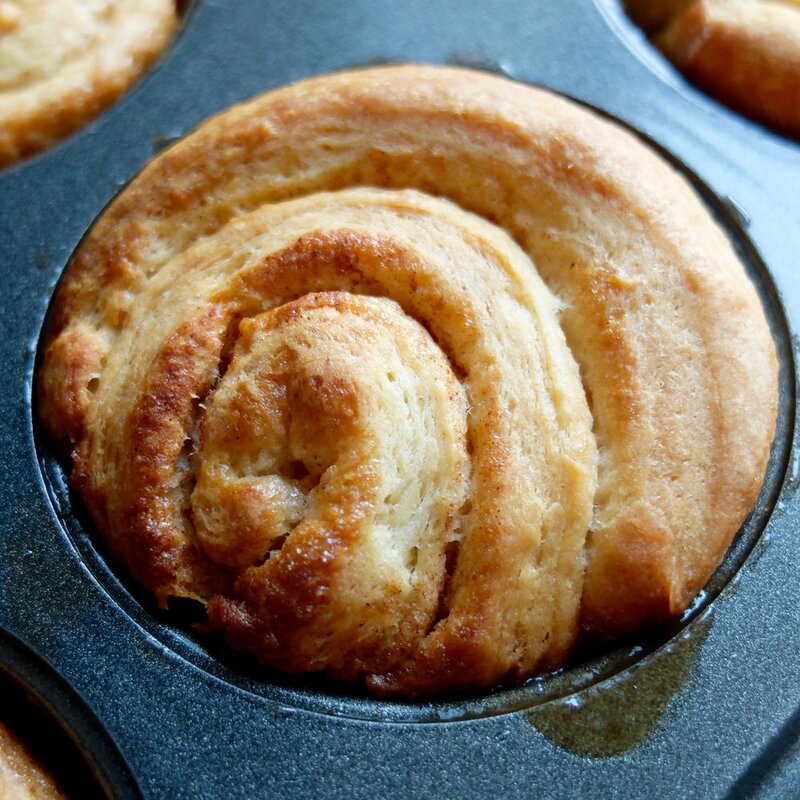 So in honour of both of my grandmothers, one of whom acquired this recipe and the other who nurtured in me a love for cinnamon rolls and whose birthday is this week, here's a hybrid recipe incorporating the best of both of their recipes. Make these to celebrate your birthday, when you need a breakfast treat, when you have someone to impress, or when you just need a grandmother's hug. 5 spoons out of five. Crispy on the outside, soft on the inside with a heavily-spiced filling, all nestled in a puddle of honey butter- these are the rolls most breakfasts can only aspire to. These won't replace my slightly different Christmas morning version, but these will absolutely be served at my next brunch and are definitely going into rotation... if I can ever get around to making a recipe more than once! Heat milk with butter until both are warm (butter doesn't need to fully melt), then pour into mixing bowl. Add sugar and salt and stir well. Add yeast mixture and stir well again. Add beaten egg and ½ of the flour and beat until dough is soft. If dough is still very wet and sticky, add additional flour, ½ c (60g) at a time and continue beating JUST until dough comes together and begins to come away from the beaters. Cover with a towel and put in a warm, non-drafty place to rise. Let rise til doubled in size (I usually leave this to go overnight so it's ready in the morning, but if you're waiting for it, will take approx. 1 hour). While dough rises, make sauce: combine all ingredients except pecans in a small saucepan and heat over low heat, stirring constantly, until smooth. Stir in nuts, then spoon 1-2 tbsp into each of 12 muffin cups. Punch down risen dough then roll each piece into a vaguely rectangular shape approximately 11x15 inches. Spread dough with softened butter, then sprinkle with cinnamon and sugar. Starting with the long side, roll dough into a log. Using a sharp knife, slice log into approx. 1 ½ inch rounds. Place each roll into a prepared muffin cup, then place in a warm spot to rise again for 30-45 minutes until the dough has filled the muffin cups, approximately 45 minutes. Bake at 190 for 12-15 minutes or until edges are dark gold and middles are pale golden. Remove from oven and let cool 1 minute in the muffin pan, then turn out quickly and serve immediately while still warm; sauce will be a delicious warm caramel at the bottom of each roll.